I have been keeping the recipe typed and the pictures of this post drafted for the past 4 days ever since amma made, back home and I had been wondering what to type for the intro part! Oh yeah, most of the times my mind gets blocked when it comes to this and badly want to proceed to the recipe directly..
Heat oil to season in a non stick kadai, splutter mustard seeds, brown the urad dal, followed by the minced ginger and the green chillies. Stir for a few seconds and throw in the curry leaves. Now pour the water. Bring it to boil, adding salt.Stir in the vermicelli stirring to combine the whole ingredients taking care not to form any lumps and close the kadai with a lid. Reduce the flame and cook until done. The semia would have cooked soft absorbing the water and see to it the strands aren't sticky and stay separate. Top the Upma with the freshly grated coconut ( which is purely optional), yes she used it, garnish with finely chopped coriander leaves and serve hot with coconut chutney. Delicious and lovely looking upma. Excellent clicks. I made this today and here you are with ur post :) This is my fav too...looks perfectly cooked. 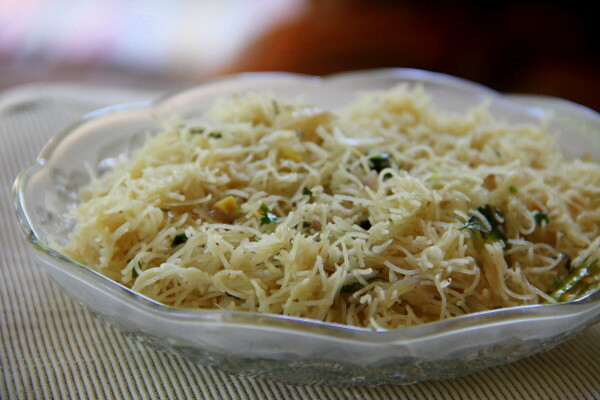 Love vermicelli upma. Make it all the time. 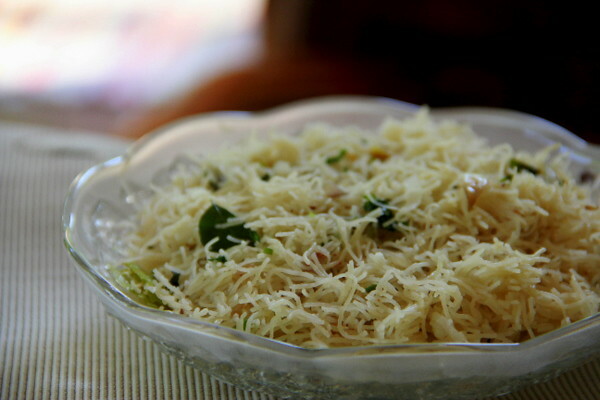 I am so tempted seeing ur vermicilli upma that if u don't mind can I just grab it up quickly? Super tempting upma, makes me hungry..well done dear. Fast nad easy snack, very delicious. This is one of my favorite breakfast.